Growing your own windowsill herb garden doesn’t have to be difficult, and is an easy way to always have herbs on hand for your cooking! A great weekend project to start with kids, or a fun DIY if you want to try growing your own herbs. While it certainly is easier then planning and taking care of a full fledged vegetable garden, it still requires a certain amount of time and dedication. Just something to keep in mind before jumping into this project feet first! The up side to growing a windowsill herb garden is that they do well pretty much year-round. Even in the summer months an indoor herb garden can be beneficial if you like to cook delicious food using fresh ingredients! There’s nothing better then having access to fresh grown herbs in your own kitchen! 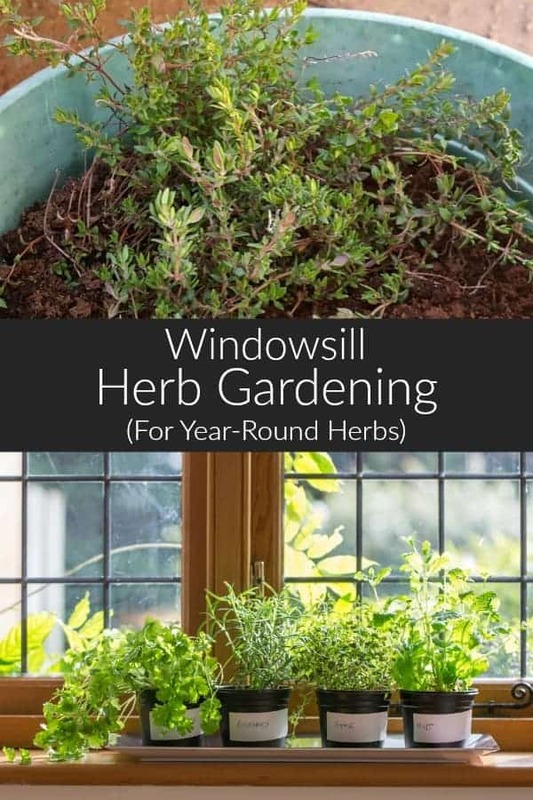 What you decide to grow in your windowsill herb garden is ultimately up to you, but if you can manage to plant and care for a few herbs you like and know you’ll use, taking care of them won’t seem like a lot of work. While growing herbs indoors in containers or even in a windowsill gardening kit (affiliate link) is fairly low maintenance, its not no maintenance. ensure your herbs receive enough light, either natural or artificial. Hopefully the suggestions below will encourage you to start your own windowsill garden at home. The easiest way to get started growing herbs indoors is to purchase a herb garden kit. It’s what I first started with, and I think probably has the lowest cost to start . Everything you need is usually included in the herb garden kit, and you don’t need to buy all the supplies separately (which can easily add up quite quickly!). When deciding on which herb garden kit to purchase, make sure that the container/pots, soils or potting medium, seeds and instructions are all included. I started with an indoor herb kit my first time around, and chose one that included a small grow light. While this particular kit didn’t include seeds or soil it was a fairly affordable way of getting my hands on a small grow light. Since I already had herb seeds saved from my own vegetable garden, I really only needed the container and a light to ensure my herbs received enough light! Whether or not you choose to start with an indoor her garden kit, these tips will help ensure a successful indoor herb. It’s important to choose a south or southwest facing window which receives at least 5 to 6 hours of solid sunlight. 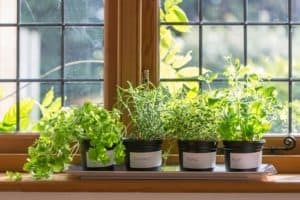 Lack of sun is the most common problem in windowsill herb gardens. If you don’t have a south facing window, using artificial lighting is an easy way to provide the light your plants need. Luckily these are no longer very expensive and small LED style lights (affiliate link) are available which can be mounted under a hanging kitchen cabinet or in window. Once the location and light issue have been dealt with you’ll need pots or containers suitable for growing herbs indoors. If possible pick a pot or container at least 6 inches deep. This allows plenty of space for the roots while still allowing space for spacer rocks to provide some drainage . Herbs don’t like having ‘wet feet’ so it’s important to keep your herb pots on drip trays and remove any excess water which may collect in it. Lets be honest. Some herbs are simply easier to grow then others. They require less attention, are hardier, and can survive the less then ideal conditions some indoor environments are. Chives are one of the easiest herbs to grow both indoors in containers or out in the garden. Part of the onion family chives are best used when fresh which makes them ideal to keep indoors, especially throughout the winter months. Chives are great for garnishing egg dishes, adding flavor in various salads, you can even make chive flavored oil, and a bright pink vinegar with it’s flowers! If you grow chives outside in a garden, you can easily split the plant and re-pot a section for use in your windowsill herb garden. 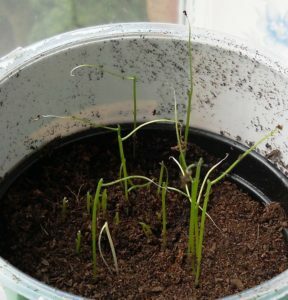 You’ll have to ensure the chives receive plenty of sunlight and water though. Pots indoor have a tendency to dry out faster and regular watering will prevent dyed out soil. Basil is another easy herb to grow in your windowsill garden. I would suggest purchasing a small baby plant at a nursery and transplanting it into a larger pot if you want to start harvesting right away. 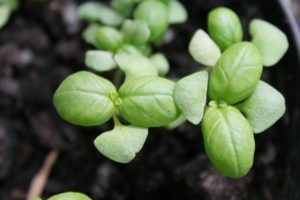 Otherwise, growing basil from seed, (while being a fun DIY project) can take at least three to four weeks before you will be able to harvest any leaves. If you are patient, and able to wait, by all means grow the basil from seed! This also allows you to learn how the plant grows and develops, and provides the knowledge to grow basil from seed you save yourself! Basil needs a lot of sun, and really benefits from supplemental light if your window does not get a solid 6+ hours of sunlight. Make sure the potting soil is moist, but not soaked. I check the moisture by sticking my finger in the soil and making sure there is moisture at least one inch down. Rotating the plant every day will also encourage the plant to grow evenly on all sides. Use your home grown basil in homemade pesto, salads (fresh basil leaves are great mixed into green leaf salads! ), as a garnish on summer dishes, even in stuffings and fillings for meats! 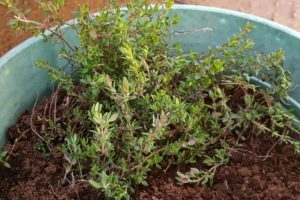 Thyme and rosemary are both quite hardy herbs and very well suited to growing in a windowsill garden. 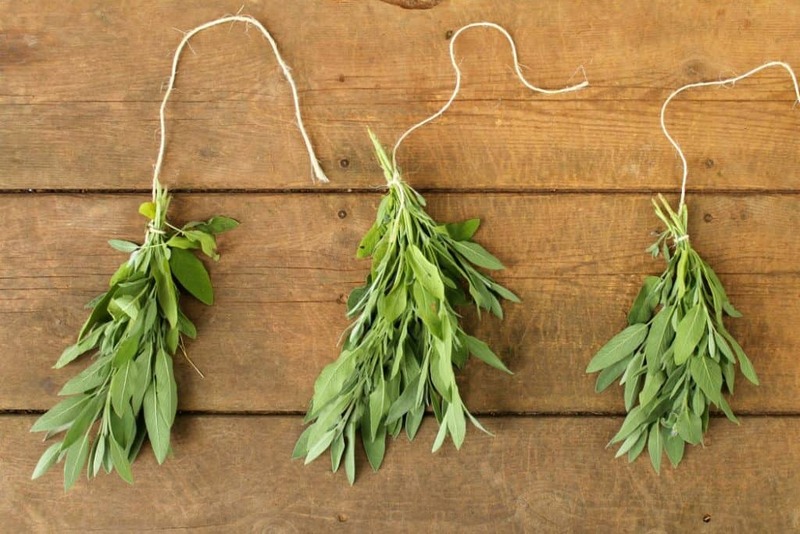 You can get away with 4 – 5 hours of sunlight a day for both of these herbs, but they will not produce as vigorously as if they had 6+ hours of sun. Both of these herbs prefer well draining, loose sandy soils. As such make sure your potting mix is of good quality and not heavy and clay like. As both rosemary and thyme have a hard time surviving the harsh cold winters of North America, I always dig up these two herbs from my outdoor garden and place them in the window to over winter indoors. Its a win – win! I get to harvest fresh herbs all winter and I don’t need to start the herbs from scratch in the spring. I simply set them back out in the garden! Fresh thyme is wonderful when used as a seasoning for red meat, and poultry. It also does well in marinades, salad dressings, and spice mixes. Rosemary is fairly potent, and does well when used to season meats, game, and poultry, just like thyme is. It can be used like thyme in marinades, stuffings, and dressings, as well as to season soups and roasted vegetable or potatoes. Try using herbs in savory baked goods and breads to make a tasty rustic bread or biscuit. 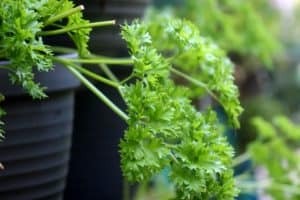 Parsley is another easy herb to grow indoors even from seed, (as long as the seedlings get enough light). Parsley prefers rich, good quality potting soil when grown in containers, and is easiest to start from seed or bought at a nursery. If starting from seed simply sprinkle the seeds on the surface of the soil and water to keep them moist. The seeds will sprout within a few days. Thin the seeds to one to two plants per container, and provide ample sunlight. While you generally only use the leaves of the parsley plant in cooking, it’s best to harvest the whole stem to prevent the plant from becoming leggy and thin. Snip the stem with scissors at the base of the plant, and then pluck the leaves of the ends before using them. The stems can be saved and used in homemade chicken stocks and broths to not let anything go to waste. As long as you don’t remove more then one third of the plant and give it time to recover, new shoots will quickly appear and fill back in. Parsley is best used fresh or dried as a seasoning or garnish for poultry, fish and shellfish, and meats. It can also be used in stuffings, fillings, and egg dishes which will be cooked. It’s quite versatile and even makes a great side when turned into tabouleh! Comment below if you have or are thinking about growing a windowsill herb garden! If you do, take a picture and tag me on Facebook & Instagram: @earthfoodandfire . I am excited to have discovered your blog/website. The recipes and tutorials are wonderful. I look forward to visiting often. Good Luck with your business/career etc. You are a real winner. Thanks Elizabeth! Glad you enjoy our recipes and gardening DIYs!